Once upon a time when you wanted to apply foundation to your skin, in order to make yourself look as gorgeously glam as you should be, you simply went to the drugstore or supermarket and purchased a pack of sponges which simply dragged the foundation across your skin in a haphazard manner. Thankfully, things have now changed, and you can purchase all manner of different sponges to help you create that perfect supermodel appearance, just as you deserve! Of course, nothing is simple in life however, and there are countless different shapes, sizes, materials, and versions of makeup sponges on the market these days, and that can complicate your shopping endeavors. Never fear, because we are going to give you the ultimate guide here and now on what a makeup sponge is, what it is used for, the different types of sponges available to you, what you should look for when purchasing a sponge, and also how to be ultra-hygienic and learn to clean your sponges adequately. We will also check out a few products on the market that are very highly regarded, simplifying your search completely. What is a Makeup Sponge? Surely the name should tell you all you need to know, right? Well no, because a makeup sponge is not simply a piece of sponge that you use to smear foundation onto your skin, it is a very important part of your makeup kit, and it should be looked after and maintained properly, whilst also being replaced regularly too. A makeup sponge is no longer replaced after one use, because these days, provided you learn how to clean your makeup sponges properly, you can use them over and over again. Sponges are now very durable and long-lasting and they are made of high quality materials, which are designed to have maximum absorbency, to soak up any excess liquid and makeup, and stop it from being over applied to your face – that look of having too much makeup on is easily avoided if you learn how to use a makeup sponge properly. Learning how to blend your makeup like a pro is also made much easier by using a sponge, because you can ‘sweep’ across the face and apply to your natural contours, in a way that simply using your fingertips wouldn’t reach adequately. In order to give you total coverage and a natural look, you need to choose the size and shape of sponge to suit you – it may even be that you use more than one sponge, one for the larger areas, such as cheeks and forehead, and another for the smaller areas, such as around the nose and eyes. Beauty blending sponge – This is a small, teardrop shaped sponge which can also be a larger size too. These types of sponge are best used for liquid and cream foundations, because they help to blend into the skin and natural contours, as the name suggests, but they are also very useful for applying concealer naturally. These types of sponge are also fantastic for creating an almost ‘airbrush’ effect to the makeup, and is also ideal for contouring. If you want to apply concealer to small areas, such as trying to hide dark circles under the eyes, a small blending sponge is the perfect go-to. Learning how to use a makeup blending sponge is not difficult, but you can check out ‘how to’ videos online for high quality tutorials! Cotton or satin powder puffs/sponges – These aren’t a regular sponge, in many ways they are a ‘puff’, and they are usually more commonly known for applying loose powder to the skin, usually after foundation application. These are quick to use, because they easily cover most of the face with a few well-placed ‘dabs’, and they are also very easy to find and cheap too. If you have particularly sensitive skin, these types of puffs or sponges are ideal, because they don’t make excessive contact with your skin – this is also where learning how to clean makeup sponges properly comes in. Contouring sponges – This type of sponge is shaped in a way that makes it ideal for contouring and highlighting in particular; these do have an overlap of usage with a blending sponge, but these are much better for contouring because of their larger teardrop shape, and for cheekbones in particular. This type of sponge can be used with liquid and cream foundations, but also bronzing products and highlighters. If you are using bronzers, this type of sponge may also help you create a more natural-looking effect, because they tend to dampen or soften the colour. Cosmetic sponges and wedges – This particular type of sponge is a good go-to if you simply want to quickly do your makeup in a hurry and you’re not too concerned about keeping the sponge to use again. These are therefore a one-off kind of usage deal. You will find these in different shapes, either circular, square, or in wedge form, and they are mainly used either wet or dry for use with foundations in liquid form, or with powders. They don’t really absorb much of the foundation, so that means that whatever you place on the sponge, does go onto your skin, to give you a full coverage kind of deal. A wedge shape is also ideal for reaching places which would be harder to get to otherwise, such as under the eyes or at the side of the nose. We now know what a makeup sponge is, and we know about the different types. Makeup sponges are a personalized kind of subject, just like anything else to do with makeup, because you need to find a shape and size that fits your face – for that reason, always shop around and perhaps mix and match the different types of sponge you use, for the different areas of your face, and the different products you want to apply. In order to get the best coverage of product, you need to know how to use your makeup sponge correctly. We have mentioned a couple of times about combining different sponges for different uses and for different products, and that is something you should definitely think about. Here are a few tips and pointers on how to use a makeup sponge correctly. Always use a clean sponge – Many people make the mistake of thinking that a sponge is going to last forever, but you need to learn how to clean your makeup sponges adequately and regularly, because otherwise the appearance of your makeup is not going to be fantastic. Learn which sponge suits which product best – If you just use one single sponge for everything, you aren’t going to get the best performance. We mentioned in our last section that certain sponges are good for contouring, some are best for liquid foundation over a large area and some are better for smaller areas, such as under the eyes and concealer. Learn which sponge suits which area and product best. Wet your sponge before using it – Before you start applying makeup, wet your sponge and squeeze it all out until it is simply just damp. This means that you are going to be able to pick up the best amount of product and you will get the best amount of coverage as a result. The science behind this is that by wetting the sponge, you are limiting the amount of foundation or product that it can take in and absorb, so you are getting better coverage on your face. If you are using powder, do not wet the sponge! – If you are using a puff or other sponge to apply powder foundation, do not wet it! This is just going to be ultra-difficult to apply and will come off all cakey in appearance. This is one situation where a makeup sponge should be very dry. Apply foundation with a sponge using a stippling motion – Stippling basically means you are patting the product onto your skin and allowing it to absorb, rather than painting it on with a dragging motion. To get that perfect airbrushed appearance which a sponge is supposed to achieve, this ‘patting’ motion is always best. Read our full guide on how to apply liquid foundation with a makeup sponge here. Use a smaller sponge for under the eyes – We talked earlier about using small blending sponges, and these are ideal for smaller areas, such as under the eyes and in the creases. Learning how to use a teardrop makeup sponge is important, because this means you won’t have gaps in your foundation, and your appearance will be seamless. Remember, the whole point of makeup is to look natural, and if you have a patchwork quilt look to your foundation, natural is not going to be something you’ve achieved! When you learn how to use a blender sponge for the first time, it’s all about that patting/stippling motion we just mentioned, but in these smaller areas, the motion should simply be slower and smaller too. Recognizing which products work best with each particular sponge is really the biggest tip when it comes to learning how to use a makeup blending sponge properly. This piece of equipment has the power to really take your makeup application to the next level, provided you know how to use it. Avoid that ‘dragging’ motion across the skin, even though when you are covering larger areas, such as the cheeks, it is very tempting to do, in order to save time. A slower, more professional manner will always give you better results, so don’t rush. Next up, we’re going to talk about how to wash makeup sponges properly, to keep them in tip top condition for longer, and also to avoid the possibility of transferring bacteria onto your skin. Do we really need to lecture you on the importance of hygiene? Surely you know that anything makeup related needs to be either replaced or washed very thoroughly on a regular basis? Well, your makeup sponges are no different, and this particular section is going to tell you how to wash makeup sponges correctly and efficiently, whilst also drilling home the importance of knowing the correct ways on how to clean makeup sponges to elongate their lifespan. So, let’s check out exactly how to clean your makeup sponges. Now, there is no hard and fast rule as to how often you should wash your makeup sponges, because you might not use them as regularly as someone else, but you should certainly make this a regular occurrence in your diary. On average every week or every two weeks is a definite must do, because if you use your sponges every day, there is going to be a certain amount of absorbance, and certainly a certain amount of bacteria. Of course, the main reason you wash your makeup sponges is because dirt and grime loves to work its way into warm and moist areas, and if you leave them to really put their feet up and move in, before you know it, you’ve got squatters who aren’t paying rent and are actually going to possibly cause a break out on your skin. Kick out those germs by learning how to clean makeup sponges correctly and thoroughly. How long should a makeup sponge last? If you wash your sponges properly and regularly, and if you use them in the way they are intended, without dragging or being too rough with them, there is no reason why a good quality sponge shouldn’t last you around three months maximum. Of course, again, we should reiterate that cleaning is key. This section is going to help you decide which makeup sponge is right for you and your needs. We are going to mention and review some of the top choices available on the market, as well as help you understand the types of cleaning products you could opt for, to help you learn how to clean your makeup sponges adequately and thoroughly. Remember, one size does not fit all, and you will probably need to purchase a few different sponges for the different parts of your face, and also the different products you might want to use. Lets get started on our makeup sponge reviews! This is one of the big hitters of the makeup world, and a very highly rated product too. For a low price, you can replicate some of those red carpet makeup looks, with a flawless canvas to begin with. This is an ideal sponge for applying liquid foundation and the pointed tip on one end is perfect for reaching the corners of eyes or the side of the nose. The flat base at the bottom is also great for the larger areas of the face, such as the cheeks, and then the main side is a piece of middle ground, which could be used for the forehead. This 3 in 1 approach to makeup application really does cover all bases. This sponge is actually designed by a top beauty blogger, Sam Chapman, so you know some research has gone into it! Learning how to use a makeup sponge is easy with a product such as this because the stippling motion is not hard to do when you have different sides which are targeted at different areas. When learning how to use a makeup blending sponge, always remember to start with a high quality product, because in this case, you really do get what you pay for. To find out more about this makeup sponge and what we think about it, visit our Real Techniques Miracle Complexion Sponge Review. If you’re ready to get the Real Techniques Miracle Complexion Sponge , you can get it here at Amazon. Washable, re-useable, recyclable. Can be used with all types of makeup. Use damp or dry. We prefer damp. Very versatile applicator. Measures 2" x 1.5"
The unique shape and exclusive material available only with beautyblender ensures impeccable, streak-free application with minimum product waste. Use with primers, foundations, powders, and setting sprays, and any other complexion product. 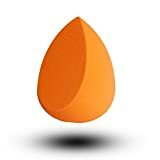 This Teardrop Beauty sponge is, as the name would suggest, a teardrop shaped beauty blending sponge. This is one of the best selling sponges on the market for good reason, and it is ideal to use with liquid foundation, powders, concealers, eyeshadows, and even blushes. Remember, if you are using powder makeup, don’t wet the sponge before using it, otherwise you will have a mess on your hands, or your face! This particular sponge is actually used widely by professional beauticians in salons, so that should give you some idea of how good it is. This is also a larger sized sponge, so ideal for using across your cheeks and forehead, but the pointed end is there for corners and around your nose too. It is actually 6cm x 4cm in size, to give you a better idea. Remember, in order to keep your sponge in top quality and clear of any bacteria, you need to always familiarize yourself with how to clean makeup sponges! How to use a teardrop makeup sponge isn’t difficult, because you have three basic sides to cover all the different aspects of your face. To find out more about this makeup sponge and what we think about it, visit our BeautyBlender Original Makeup Sponge Review. If you’re ready to get the BeautyBlender Original Makeup Sponge , you can get it here at Amazon. The Aesthetica Cosmetics Beauty Sponge is the only blending sponge applicator tool for powder, cream and liquid makeup you'll ever need. This makeup sponge provides a flawless, edge-less application to help you look your best, every day, and is perfect for contouring with the Aesthetica Cosmetics Cream Contour Kit. Big named brands usually deliver quality, and this particular sponge is certainly high up on the desired list. An attractive black shade, this sponge is ideal for liquid and powder cosmetics, and gives you maximum coverage, with easy control thanks to the tapered tipped end and the general shape. Contouring is quite easily achieved with this sponge too, and if you can learn how to do it, you’ll have a seriously professional look to your makeup application! You can easily use this sponge either wet or dry, with the same level of control, and it has a good level of ‘bounce’ to it, so you can get that stippling effect bang on for the best finish. To find out more about this makeup sponge and what we think about it, visit our Aesthetica Cosmetics Beauty Sponge Review. 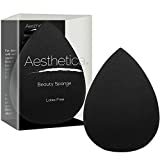 If you’re ready to get the Aesthetica Cosmetics Beauty Sponge , you can get it here at Amazon. Use wet or dry, Latex Free sponges apply an even, flawless face. Foundation, concealer, powder & blush go on beautifully. Great for prepping the skin with moisturizers and BB creams. Made from non-latex foam to reduce allergies and 100% Vegan and Cruelty free. The fact that you get four sponges in this set gives you extra life already, because you won’t have to go around trying to find a single sponge when your old one finally gives up. The sponges are also black, which is easier to use because you can see exactly where the product is on the sponge. In terms of performance, this handy set is ideal for all types of makeup application, so whether you want to contour, blend, or highlight, you’re covered. The sponges are medium sized, which gives you more control, especially over smaller areas on your face – a good tip is to have one sponge for small areas, e.g. use the tapered end more and the other side for holding control, and another sponge for only using the flat side, etc. This will give your sponges more lifespan overall, because they are not constantly covered in cosmetics. To find out more about this makeup sponge and what we think about it, visit our JPNK Teardrop Blending Sponge Review. If you’re ready to get the JPNK Teardrop Blending Sponge , you can get it here at Amazon. You have major application control with this sponge, because of the shape. This is a very cleverly designed sponge, with one rounded end, ideal for larger coverage areas, such as the cheeks, and a large, flat side, which is great for blending and highlighting. The pointed end is obviously for getting into those harder to reach places, such as the corners of the eyes, underneath the eyes, and in the crease of the nose – basically, you won’t miss anywhere with this sponge. Another plus point is that the sponge is latex-free, so this is a good one for anyone with allergies, and you can choose to buy it in a one sponge set, or two sponges, to reduce the cost down a little. To find out more about this makeup sponge and what we think about it, visit our AmoVee Pro Makeup Sponge Review. If you’re ready to get the AmoVee Pro Makeup Sponge , you can get it here at Amazon. Yes, we are talking about makeup sponges, but as we have reiterated over and over again, you need to know how to clean your makeup sponges, and that means you need a few tools to help you do that. To give you a bit of an overview on how to wash your makeup sponges adequately, we’ll throw a few cleaning products and tools into this review section too. On a vain kind of note, you can choose from several different attractive colors for this particular cleaning set, but it’s the function we should really be interested in! This is a cleaning mitt, and it helps you to clean your brushes and your sponges adequately and easily. Basically, it works a little like a thimble, in that you place one or two fingers inside the silicone mitt, and you use the groves over the top to rub the sponge back and forth, therefore unclogging any stubborn traces of foundation or other makeup products. The key point here is not to be too aggressive, because if you are, you might end up damaging your sponge, but overall, a gentle but rigorous motion is enough to give your sponges a really good clean, on top of the soap and air dry method we talked about in our section on how to clean your makeup sponges. Of course, if you choose this product you can also use it to clean your other makeup tools, such as your brushes. If you’re ready to buy or take a look, you can find the Makeup Washing Brush here at Amazon. Let’s throw something a little different into the mix here, with a silicone make up sponge; yes you heard right, silicone! This handy little makeup applicator (can you really call it a sponge?) is one of the best selling of its kind, and it is very easy to use too. The fact it is silicone means you can grip it easily, and it also doesn’t absorb any foundation or other makeup types. You basically get the best finish available, because whatever you place on the silicone, ends up on your face, provided you use the stippling motion we have referred to several times over already. Many makeup artists do use these silicone puffs, because of the reasons we mentioned above, and they can be used with all different types of makeup, such as liquid or powder foundations, concealers and eyeshadows. Another plus point is that this type of makeup applicator is super-easy to clean, and very long lasting too, provided you do the usual regular cleaning progress, as you would with the other products we’ve described. If you’re ready to buy or take a look, you can find the Silisponge Beauty Sponge here at Amazon. To get the most airbrushed, professional and flawless look, you should use the best tools in the business, and this one is very highly regarded. You don’t have to worry about streaking or creasing with this product, as it is super smooth, giving you the best finish to your foundation applications. The sponge is also latex free, which is a major plus point for anyone with an allergy. The sponge also has that aforementioned pointed end, which gets into the harder to reach places, and it is ideal for not only foundation application, but also highlighting and contouring too. Obviously you need to practice and really learn how to use a teardrop makeup sponge before you get in there and give this airbrush makeup business a try, but with the right tools, you will be able to get there. If you’re ready to buy or take a look, you can find the WunderBlend Wunder2 Complexion Sponge here at Amazon. This is another cleaning tool, and although the title might be misleading, it can be used to clean sponges too. The tool is made of silicone which bends easily to help you get into tight spots on your sponge, and it has three different ridged shapes on it, which means a better cleaning experience. Again, the methods for how to clean makeup sponges shouldn’t be forgotten, because even if you use a tool such as this, you still need to clean your sponge using gentle soap, wring it out, and then let it air dry, but this can certainly give you a more thorough clean afterwards too. You can get the ESARORA Makeup Brush Cleaning Mat here at Amazon. This particular cleaning soap is ideal for brushes, but it can be used for your sponges too. You only need a small amount however, so don’t go overboard on usage! The tin contains 40g of the cleaning soap, and it effectively works to remove dirt and grime which builds up inside and on the top of your sponges, keeping them cleaner for much longer. Use the same methods we talked about earlier on how to clean your makeup sponges, rinsing out any excess soap and wringing dry really well, before allowing your sponges to dry in the fresh air. Yes, regular soap, or even baby soap does a good job, but if you really want to pay special attention to your makeup tools, a dedicated soap is a good way to go. This section has talked about a few of the best makeup sponges on the market, as well as the cleaning tools and products you can use to keep your important makeup tools and sponges in the best condition they can be, for longer. Of course, there are countless other products on the market, but the whole point of makeup sponge reviews is to flag up the most popular and most highly rated products, giving you a much better idea of where to spend your all-important cash. If you’re ready to buy or take a look, you can find the Da Vinci Cleaning Soap here at Amazon! Check out some of these products and see which work best for your budget and your needs. This guide is designed to give you all the information you need to correct the right makeup sponge for your needs, as well as learning how to use them, and how to clean them too. Makeup sponges really have revolutionized the way we wear makeup, and they have also made it easier for us mere mortals to apply our makeup just the same as a professional makeup artist would. Remember to memorize the ways on how to clean makeup sponges, to prevent any of those dreaded breakouts, and also make sure you learn how to use a makeup blending sponge properly, before diving on in there! When you learn how to use a makeup sponge properly, the makeup world really is your oyster, and before you know it, you will have the supermodel makeup, just like those on the red carpet! Conquer Your Dry Skin for Good! Makeup Blender Sponges, What’s the Deal?